Preheat oven to 180°C (350°F). Line 2 baking sheets with parchment paper. In large bowl, using an electric mixer on medium speed, beat together butter and sugar until fluffy. In separate bowl, stir together flour, baking powder and salt. Stir half the flour mixture into the butter mixture until almost combined and dough starts to form. 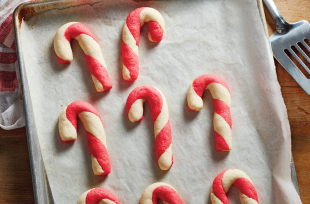 Blend in milk and peppermint extract completely, then mix in remaining flour mixture. Divide dough into 2 equal portions; place in separate bowls. Knead in drops of food colouring into 1 portion to attain a reddish colour. (Note: Green food colouring can be used instead.) Leave the second portion plain. Using mounded tablespoons of dough, roll each piece into a rope about 4-in. (10-cm) long. Make 18 red and 18 plain ropes. Pair 1 of each colour. Pinch together each pair at one end; twist the colours together. Roll each twist into a smooth rope, about ½-in. (1-cm) thick. Bend the ropes into candy cane shapes. Make 18 canes. Bake in batches on lined baking sheets, 12 to 15 min., until cookies begin to firm up and turn pale golden on bottoms. Cool on baking sheet 5 min. before transferring to wire rack to cool completely. Store in airtight container 2 to 3 days.